Holocaust survivor Ariela Rojek, right, was 11 years old in 1945 when she and 2,500 other concentration camp prisoners aboard a train near Magdeburg, Germany, were liberated by American forces including 1st Lt. Frank Towers, left with his son Frank Towers Jr., center. 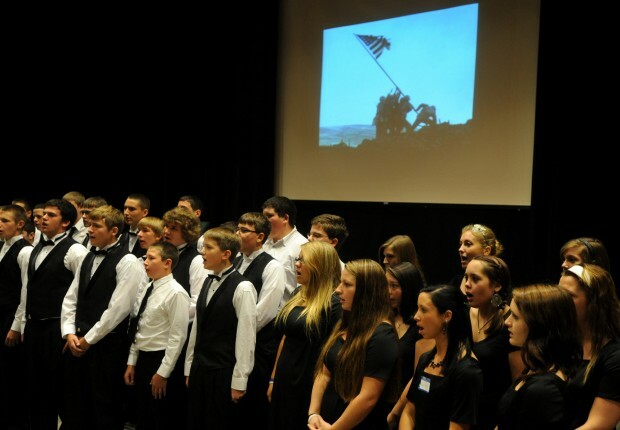 "You gave me my second life," Rojek told Towers Wednesday, Sept. 21, 2011, at Hudson Falls High School during an event reuniting soldiers and survivors. HUDSON FALLS — In preparing to become soldiers, they were taught many things, most of all how to fight the enemy. But on April 13, 1945, members of the U.S. Army’s 30th Infantry Division were caught unprepared. As they cut across Germany, through cold weather and 18-hour days of fighting, they found a train. Inside were 2,500 Jews who were packed together for six days — sick, dirty, with little food, and infested with lice, fleas and ticks. The soldiers, riding Sherman tanks, knew how to fight, but were not prepared to treat so many people or for the shock of the train conditions. “What we were to witness in those days was something we were not prepared for,” said Frank Towers, a first lieutenant in 1945, as World War II was nearing its end. On Wednesday, Towers, 94, discussed his role with the soldiers who found the train, during the first of a three-day program to teach the Holocaust and reunite the former soldiers with the people they liberated 66 years ago. The event was at Hudson Falls High School and was the third of its kind there since 2007. Towers, who traveled from Florida, was one of two former soldiers at the event. Along with them were four men and women who were children on the train. The Nazis abandoned the train, which was traveling to a concentration camp. While the U.S. soldiers did not have the resources to treat the passengers, they kept them safe until they could be transported to a military base with a hospital, Towers said. Towers spoke at a morning event to kick off the program. Through speeches, photos and an audio recording from the 2007 event, the story of the 30th Infantry’s discovery was told. In addition, the former soldiers and Holocaust survivors were honored at the event. Also explained was the role of the Hudson Falls school. A decade ago, Matt Rozell, a history teacher at the school, interviewed Carrol Walsh, a former soldier, to record his memories of World War II. It was then that Walsh recalled the day his division found the train near Magdeburg, Germany. Rozell and his students put the story of the train on a website. Then, over time, people who were passengers on the train found the website and contacted Rozell. That spawned two reunions, the first in 2007 at the high school, where a handful of Holocaust survivors met Walsh for the first time. Since then, Rozell has been in contact with 216 people who were on the train and three former soldiers from the 30th Infantry. Some Holocaust survivors and the former soldiers have also been able to meet on their own. This week’s event will be the last at Hudson Falls because of the difficulty of arranging it and the age of some of the soldiers and Holocaust survivors, Rozell said. The event uses the theme “Repairing the World” to teach about the Holocaust. There will be speeches from Holocaust survivors, author Robert Miller, and Helen Patton, granddaughter of Gen. George Patton. Helen Patton is the founder of the Patton Stiftung Sustainable Trust in Germany, which uses art and culture to create peace between groups that have sometimes been in conflict with each other. On Thursday, the Holocaust documentary, “Paper Clips,” will be shown. Walsh, who was present at the 2007 and 2009 reunions but was absent Wednesday because of health reasons, had a letter read at the morning event. In the letter, he wrote that rescuing the captives from the train was part of his job as a soldier, and thus he’s owed no debt. Instead, he wrote that the Jews are owed the debt for being victims of genocide, of losing their freedom, dignity, family members and lives during World War II. “We can best pay that debt by keeping the memories of the Holocaust alive,” Walsh wrote in his letter. Bruria Falik, a passenger on the train who today lives in Woodstock, attended the reunion. She said she was pleased by the extent of the school to study and teach the Holocaust. She said she felt “unexplainable gratitude” when meeting the soldiers who liberated her. Leslie Meisels, another passenger on the train, came to Hudson Falls from Toronto, where he lives and speaks at schools about the Holocaust. 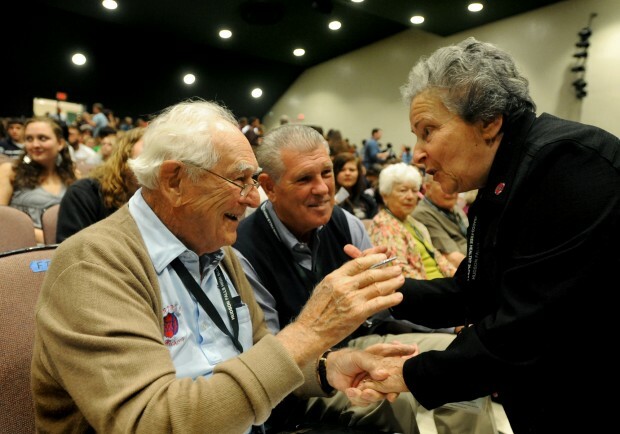 “There are no words to describe that feeling,” Meisels said of meeting the soldiers and Holocaust survivors. After the morning event, students had their photos taken with the soldiers and survivors and obtained their autographs. Cassandra VanEvery, a high school freshman, said it was hard to believe a group of people would attempt genocide. “It was very emotional,” Cassandra said of the event. Freshman Jacob Dimick said the event was hard on him, too. Not only was it difficult to hear about the horrors the Jews encountered, but it also reminded him of the stories he heard from his uncle, who was a soldier during World War II. 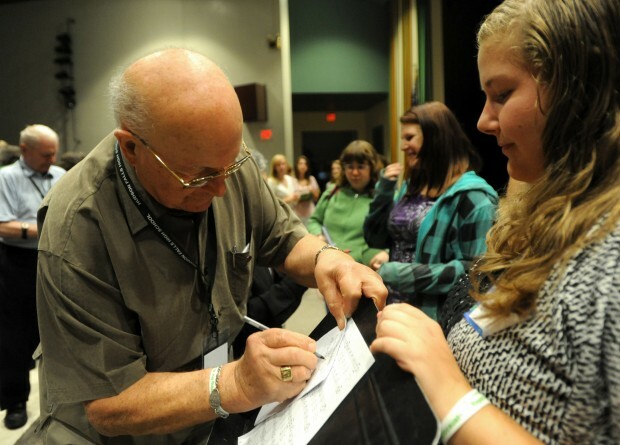 Holocaust survivor Leslie Meisels, left, signs a program for Hudson Falls senior Taylor Bump during Wednesday's "Remembering the Holocaust, Repairing the World" event. Meisels, who currently lives in Toronto, stressed the importance of relaying his experience to young people "so they remember and fight against discrimination, hatred and injustice." By recalling history and meeting others who lived it, people like Towers said it’s important for students to learn about the Holocaust so it can never be repeated.